GRAND JUNCTION, COLO. – It's rare that a space mission starts exactly as planned. The weather sometime delays a launch, for example, or a technical problem may keep a spacecraft on the ground for longer than originally planned. In the case of Crew 133 — with six people flying from as far away as France to meet here for a simulated Mars mission — weather and other logistics issues meant most of the crew arrived later than planned. The important thing, however, is that everyone did get here by late Friday (Jan. 3) — a few hours later than planned, but still early enough to leave for the Mars Desert Research Station (MDRS) on Saturday (Jan. 4). My journey was less eventful — an on-time flight to Las Vegas, followed by a beautiful drive to this high-altitude city — so I spent my first few hours here trying to keep our crew apprised of who had arrived and who was still on the way. Crew 133, led by the University of North Dakota, hours before departing for Mars Desert Research Station. From left, Pedro Diaz-Rubin, Matthieu Komorowski, Elizabeth Howell, Joseph Jessup, Paula Crock and Gordon Gartrelle. 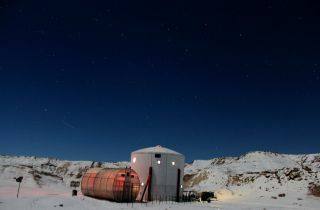 MDRS is a facility run by the nonprofit Mars Society, which advocates for manned exploration of the Red Planet. The station is based in the Utah desert a few miles from the small town of Hanksville. As much as possible, the crew on this expedition is going to try to simulate what it's like to live on the Red Planet. Our habitat is small, our water is limited and in most cases we can't go outside without a spacesuit. In the first step in our mission, the official crew handover, the old crew had to transfer the base to us. This requires about a dozen people to crowd into quarters more suited for six or seven souls. Since the departing group (Crew 132) had seniority, it got priority for the bedrooms. The rest of us slept on the floor in our sleeping bags on Saturday night before people left. Once they took off, we got the rooms to ourselves. My University of North Dakota-led crew is made up mostly of distance students who never met in person before arriving for the mission, so we had made extra efforts to get to know each other. Emails were frequent before we set out for the desert. I tried to talk to everyone on the phone at least once before leaving. The mood Friday night, despite everyone's fatigue, was jovial. And we were excitedly reading the final Crew 132 updates to see what we are about to experience. The last reports from that crew spoke of satisfaction with the mission, but also this feeling of wanting to hold on to the last few hours because things are over soon. That's fully what the six of us in Crew 133 are expecting to feel like when our two weeks are up on Jan. 19. There won't be much time for reflection, though. Our crew will spend most of our waking hours trying to crowd in as much science and engineering as possible. In between joking about travel troubles on Friday, much of the conversation tilted towards plans to get the work done. We're starting our mission close to the new moon, which bodes well for the crew members focused on astronomy. Other experiments deal with engineering and geology. Meanwhile, most of us have never been in a spacesuit, and many have little experience using ATVs, the primary form of transportation during our mission. We will have a day or so to get used to the facilities before going into a full "sim" to replicate Mars exploration as best as possible. Our lives will be different for a couple of weeks, but we've been told that the closer we get to a real Mars mission, the more rewarding it will be. Eventually — who knows? — the data we gather could help lay the foundation for a real voyage to Mars.